...or start by taking a quick course on EFI Fuel System Conversion! Congratulations! Taking the step to move from carburetion to Electronic Fuel Injection (EFI) is commendable--and comes with some great rewards! But it does require some upgrades to be made to your existing fuel system. 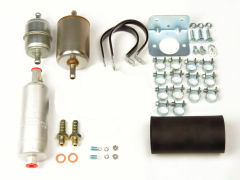 We are frequently asked what fuel pump and other components are required to make the carb to EFI switch. This page sets out to answer those questions and give you a one-stop shop to purchase the exact components you need to be successful! How Do I Upgrade My Carburetor Fuel Pump? The biggest difference between a fuel system for a carbureted engine and the fuel system for an EFI engine is the pressure. Most carburetors want about 2-4 PSI at the inlet. Any more than that will push the fuel right past the needle valve and flood fuel into the engine. To accomplish this, carbureted vehicles use a much lower-pressure pump (you'll need to change that) and a non-return style regulator (you'll need to change that too.) The non-return style fuel pressure regulator simply holds back whatever few pounds of excess pressure is supplied by the low-pressure fuel pump and only lets through what pressure is required by the carburetor. How Much Fuel Pump Do I Need? *All values shown for gasoline. Multiply by .72 to calculate the amount of horsepower supported when using E85. When converting from carbureted fuel system to EFI fuel system, inline is generally the easy answer. 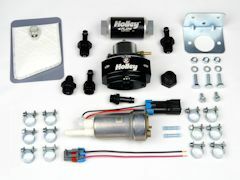 Buy one of our inline EFI conversion kits, install the pump as close to the tank and as low as possible. Ensure that you install a filter before and after, and you are all set. You likely don't even need to drop the fuel tank! However, some folks just aren't happy with inline fuel pumps and want to go in-tank. Maybe they need to run E85 (which is only compatible with the 450 LPH in-tank pump) or they need more than 255 LPH (the maximum individual inline fuel pump. In-tank pumps are, admittedly, a bit quieter (although the Walbro GSL-family of inline fuel pumps are remarkably quiet for performance fuel pumps.) In that case you need to be prepared to do a bit more engineering as a result of your choice. Our in-tank EFI conversion kits include a in-tank pump along with a sock filter. It is going to be necessary for you to use a wiring bulkhead (included in the kit) to provide you with power in the tank for the pump. Then, you are going to need to engineer some sort of holder to which to affix the fuel pump so that it stays firmly in place, upright and at the bottom of the tank. Consult a fabricator who has experience in this area if you have specific questions or need assistance. You will need a return-style fuel pressure regulator to deliver the correct fuel pressure to the engine. Those are readily available. 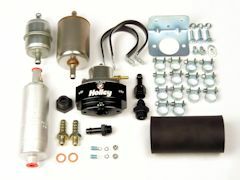 We recommend the outstanding Holley HP EFI Adjustable Fuel Pressure Regulator. It is adjustable from 15 to 65 PSI. However, the intuitive reader will realize there is currently only one fuel line between the fuel tank and the engine compartment. That means that a second fuel line must be installed for virtually all EFI fuel system upgrades. It is not necessary for the line to be metal (as is the OE fuel line.) We recommend using a good quality EFI fuel hose that is available at any auto parts store. It is left as an exercise to the installer to determine the safest way to correctly secure the fuel line in place in a manner that ensures that it is not crimped or kinked. An abundance of cable ties fixing the hose to the OE metal line usually works well. Note that sometimes it is advisable to use the metal line as the return and the hose as the feed. This is particularly true when one is running an especially-high horsepower engine and might be feeding two or even three fuel pumps into a single line. In this case, source a larger hose to accommodate the large amount of fuel that will be needed. Where Do I Return Fuel To The Tank? The fuel tank that was installed in your carbureted vehicle likely made no provision for fuel return. That being the case, this is another opportunity for you to be creative. Many tanks have a vent that has been used by some installers to attach the return line. We don't have enough experience to either confirm or deny the efficiency of that method. However, on all of our kits we offer the option of ordering a fuel line bulkhead. This allows you to drill a hole in the top of the tank and insert through that a hose barb fitting. The bulkhead fitting includes washers for both sides of the fuel tank and should provide perfectly for your requirements. Because there can be such a broad range of electrical component requirements we don't offer specific kits for this. These components are typically readily available at most auto parts or hardware stores. We are happy to give you some insight into the things you should consider when laying out your electrical connections. First and foremost, the fuel pump should never be wired to the ignition switch. Virtually all EFI controllers will provide a 12-volt line for the fuel pump. That line should be used to switch a standard 30-amp relay, which in turn powers the fuel pump. The reason for this is that the controller (ECU) knows when the engine is running and turns off power to the pump if the engine is not running. The engine will quit running if the fuel line is cut, which in turn will turn off the fuel pump. If you wire your fuel pump to the ignition switch, it will continue to pump fuel out the cut line. Bad. Very bad. Run a same-sized ground wire and fasten to the most solid grounding surface you can reasonably find. Failure to adequately ground the pump will result in reduced flow, increased power draw, potentially blowing fuses and shortening fuel pump life. Don't get yourself in trouble because you figured just fastening a 6-inch ground wire to the rusty frame nearest the fuel pump would be adequate. What If I Use A Bigger Fuel Pump Than I Need? Can I Run E85 Through These Pumps? At this time, of the pumps listed only the 450 LPH in-tank pump (F20000267) can operate with E85. The problem is lubricity. Alcohol provides virtually no lubrication and, at 85% alcohol, E85 is an extremely harsh fluid to try to pump. In addition, high concentrations of ethanol (above 10% found in most pump gases) do other bad things to the internals of pumps that are not specifically rated for E85. If you have any intention of running E85 then use the 450 LPH pump and recognize that 450 LPH of E85 can only support 850 naturally-aspirated HP or 680 turbo or supercharged HP. What If I'm Running Throttle Body Injection? GM's fuel injected engines prior to 1996 were largely low-pressure throttle-body injection (TBI). There is nothing wrong with these engines--not only are many still in service but Holley and other manufacturers make high performance throttle bodies for them. The key difference is the fuel pressure. These TBI units require no more than about 12 PSI for normal operation. If you are replacing your carbureted engine with one of these GM TBI engines, it is imperative that you get a low-pressure pump and a fuel pressure regulator suited for TBI pressures. Fortunately, we have kits for those too. Our Carb to TBI conversion kit does not include a fuel pressure regulator since one is built into the throttle body. If you require adjustable fuel pressure then consider the JET 61500-series. Note that we don't offer an in-tank pump kit for low-pressure / TBI applications. This is because Walbro's largest-flowing low-pressure pump is only 115 LPH, which we figured would be too small for most applications. Instead, choose the low-pressure / TBI inline pump kit that makes a solid 155 LPH at 12 PSI. 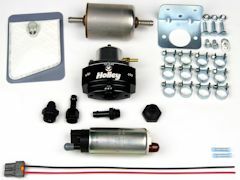 Walbro high performance fuel pumps are incredibly durable but, because of the incredibly tight tolerances that make this such a powerful pump, a single hard bit of debris can effectively end its life. However, you don't have to worry about that because all of our Carb to EFI conversion kits include both inlet and outlet filters. In the event you are reading this and realize your pump isn't running an inlet filter, you can remedy that by installing a filter of no more than about 35 microns in front of the pump. You can go as fine as 20 microns (which we use) if the filter media is large enough that the filter does not become plugged. After the pump, it is necessary for there to be filtration to about 10 microns before the fuel injectors. While it may seem intuitive to simply install a single 10 micron filter before the pump and none after that is not advisable. Because fuel tends to get dirty in transport, storage tanks, and from debris that builds up in the tank, a 10 micron filter before the pump will inadvertently become plugged and stop flowing, which is a danger to the engine. And since the fuel pump itself can slough off material (particularly during the break-in period) it is always necessary to run a 10 micron filter after the pump to protect the injectors. What If I Need More HP Than One Pump Can Feed? Hey, it happens. Two days before writing this I spoke with a fellow who needed two 450 LPH and one 255 LPH pump to run this psycho Corvette he built. If you find yourself needing more than one pump then contact us and we can build you a custom kit. Do You Require Hosebarb Adapters?